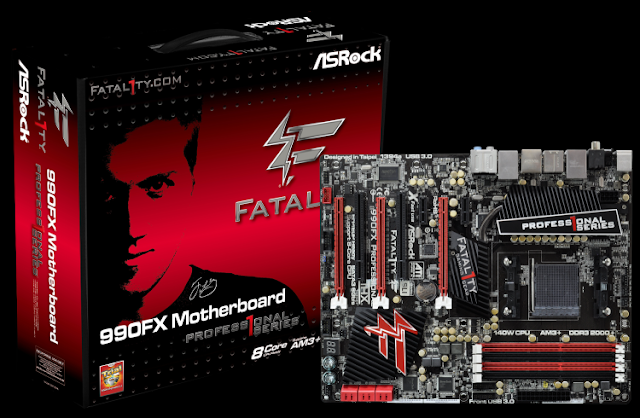 TAIPEI, Taiwan, July 15, 2011 – Johnathan “Fatal1ty” Wendel knows that gamers have different CPU preferences, so he worked with ASRock engineers to develop a full featured motherboard for the new AMD 990FX chipset, supporting the AM3+ Socket and 8-Core CPUs. AMD is known for cost effective processing and superb over-clocking features, making it a favorite among gamers. “One of the great aspects of the ASRock - Fatal1ty relationship, is that Johnathan is always pushing for new gaming features, giving our engineers suggestions that help them develop applications like XFast LAN™ , F-Stream and the Fatal1ty Mouse port.” commented James Lee, VP of ASRock Sales and Marketing. “The 990FX is the fourth board in our line of Fatal1ty gaming motherboards, so we now offer a full range of products for the serious gamers of the world.” said James Lee. Gaming is a way of life for Fatal1ty, and a high-spec system is a must for playing the latest games. With the increasing popularity of on-line gaming, the 990FX was developed with that in mind. The new AMD 990FX chipset supporting the AM3+ Socket and 8-Core CPUs makes a perfect gaming platform for the cost conscious gamer who wants advanced features, without an advanced price. This is a premium motherboard, coming with top-end specifications. A Digital PWM design improves the CPU power solution and delivers Vcore voltage to the processor more efficiently. Combined with V12+2 phase power, it allows for the most stable overclocking possible. To provide the ultimate control in games, gamers need look no further than this customizable function: the Fatal1ty Mouse Port. With a wide range of 125 Hz to 1000 Hz for the mouse polling rate adjustment, gamers obtain more precise control of their mouse. The 3 graphic card slots support AMD Quad CrossFireXTM, 3-Way CrossFireXTM and CrossFireXTM, as well as NVIDIA® Quad SLITM and SLITM. This set-up allows the Fatal1ty 990FX Professional motherboard to support virtually any kind of graphic card set-up, providing gamers with the best possible graphics configurations.